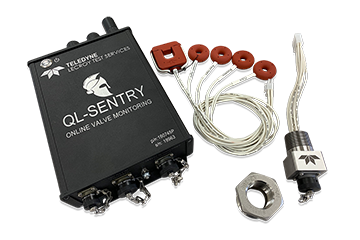 The SENTRY is a permanent Motor Operated Valve Monitoring System designed to connect to a set of user-defined monitoring sensors on the valve. SENTRY records and stores data from the sensors for hundreds of valve strokes. This data can be retrieved either via Ethernet or using a standard USB flash memory offering easy transport to an office environment for analysis using TTS’s QUIKLOOK 3. Data from every stroke under actual plant conditions can be imported into Teledyne’s MOV Test Database Software to determine valve operating acceptability and trending. SENTRY can be mounted individually or in multiples based on user preference or location of valves. Operation can be monitored by reading the LCD on each unit. SENTRY continuously monitors sensor activity, however data is recorded only when a user-defined event occurs (e.g., the motor energizes). No valve testing program is required to address Generic Letter 96-05, as each time the valve is operated during actual plant operation, the required data is recorded by SENTRY. Each valve operation is dynamic since the valve is operated, as required, under actual system operating conditions. In addition, there is no requirement to perform additional valve testing, thereby reducing the potential for fatigue failure or excessive wear of critical valve parts. Preventative maintenance can be based on actual operational valve data rather than on a schedule (i.e., every two years). This results in reduced cost and sharper focus on valves the data indicates require maintenance. The use of TTS’s Quick Stem Sensor or SMARTSTEM in conjunction with SENTRY is recommended for low margin or problem valves due to the accuracy of these stem torque and thrust sensors. However, SENTRY is capable of monitoring any existing valve sensors. At a typical nuclear plant, the average cost to perform an MOV diagnostic test -- including materials, installation and personnel but excluding radiation dose cost -- usually exceeds the cost of a SENTRY and its installation, including materials. The MOV diagnostic test cost includes applying or assuring acceptability of existing sensors, cycling the valve a number of times to obtain data, and properly setting torque and limit switches to accommodate the required thrust to assure valve closure. These tests are performed for static conditions (no ΔP across the disk) and for dynamic conditions (as close as possible to actual operating ΔP across the disk). Test result plots are compared to actuator and valve capability to assure weak link values are not exceeded. Included in the above test cost is the waiting time required for operations to release a valve for testing. MOV testing, as currently performed, is difficult to execute for many valves when the plant is on line and for some valves it is impossible. Based on the above, the Return on Investment for SENTRY procurement and installation can be realized in 1 fuel cycle. Further, MOV testing is no longer a schedule concern during refueling outages and the potential for fatigue and excessive wear associated with testing is eliminated.